If you can see what's on the screen, you can see this was from 32 years ago (as of tomorrow). My sister and I, in Florida on vacation, watching the moon walk. 42 years Warren! Time flies. Is that what you call a "lost decade". 32 years? I sense a bit of Freudian denial. That aside, I wish I had a similar picture of me. I was sitting beside a barracks at Fort Bragg, N.C. in basic training. This was a nice respite for a draftee about to be sent to the Republic of Vietnam. Now I'm feeling old. I was in college after having just returned from the service and a visit to SVN. You do know that was all faked on a movie set, right? I mean everyone knows that, right? My family was also on vacation in Florida, at Vero Beach. We watched the launch from Satellite Beach, with a huge crowd. Staying up late and watching the moonwalk was a big hit for a kid. I loved the space program, and feel sorry for kids today, who don't know how exciting the adventure of it all was. My family all watched the moon walk on the black and white TV in an upstairs bedroom - it got the best reception. 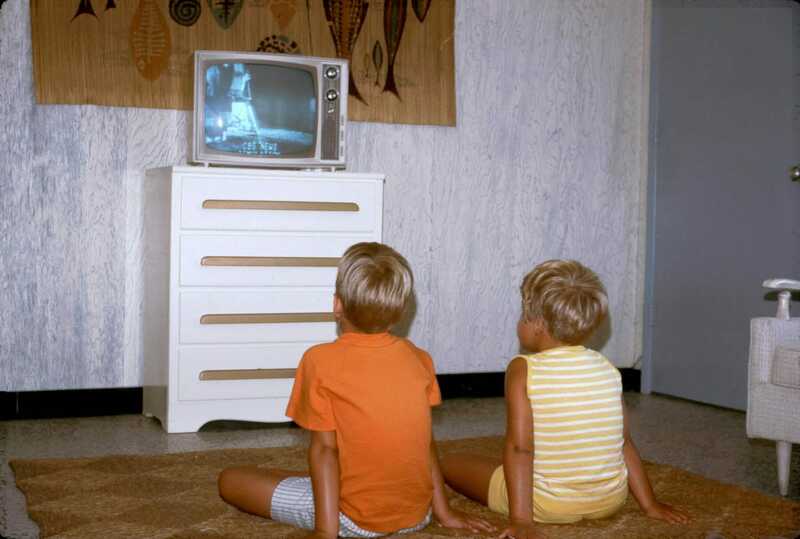 Try explaining b/w tv, 3 channels, and rabbit ears to today's kids. It was probably be another 42 years before we do it again. Folks! My wife was born on that day. Trust me, it's THIRTY two years ago ;^). We watched in W. Lafayette, IN, on a 12" B&W, the only TV in the house. I took my granddad's camera and took a shot of the screen. For posterity. Next June would be graduation and USN for at least 4 years. I missed most of the other launches while away off the coast of SVN, in the Indian Ocean, or replenishing our stores in the PI. Awesome picture to have! Glad we're finally going private for the basic space transport as we should have long ago, though.